Nathalia is a rural township on the Broken Creek, about 30 km east of where the creek joins the Murray River in northern Victoria. It is 40 km north-west of Shepparton. The origin of the name is unclear. In the mid-1870s news was reportedly received from a passer-by in the Nathalia district that a titled European lady had given birth to a daughter named Nathalia. The Queen of Serbia, formerly Natalya Keshko (and alternatively spelt Natalie and Nathalia), was married in 1875 and gave birth to a son in 1876. No better explanation has emerged as to the source of the name Nathalia. Before the name Nathalia gained the formality of gazettal in 1880, the name Barwo was more widely used. The Barwo school (1877) became the Nathalia school in 1882. The town also gained a hotel in 1880, a newspaper in 1884, a flour mill in 1885 and a mechanics' institute in 1887. 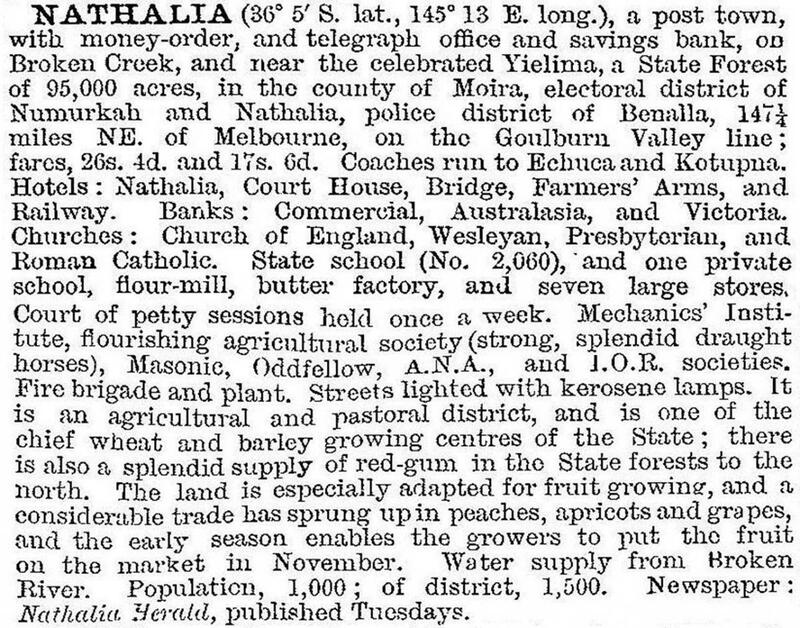 In 1889 the Victorian municipal directory described Nathalia as a rising township with two bank branches, a school, a mechanics' institute, a large private hall, three churches, flour mills, two cordial factories, a printing office, four hotels, a number of shops and a railway line from Numurkah (1888). In 1914 an Irrigation League was formed, inspired by a recent drought and the benefits on the other side of the Goulburn River with the Western Channel from the Goulburn Weir. Unfortunately the waters would not stretch to Nathalia, even when the Sugarloaf (Eildon) and the Yarrawonga Weirs were completed in the 1930s. Farmers continued with adverse dry seasons and occasional years when floods inundated paddocks and threatened the township. Wheat was the mainstay, silos replacing the grain store at the Nathalia railhead in 1942. In 1945 the State Government began the acquisition of dry-farm properties in anticipation of settling returned service personnel on irrigated orchards and dairy farms. By 1951 a work camp was in the Nathalia district to construct irrigation and drainage channels. Nathalia and district's population increased by 70% between the 1947 and 1961 censuses. Housing Commission houses and an extension to the shopping area were completed during the 1950s and a hospital was opened in 1955. On 26 April 1957, the municipality which was named Nathalia shire (30 May 1957), was severed from Numurkah shire, after a period of acrimony between the two towns. Since 1919 the Nathalia school had been a Higher Elementary one, taking local children and boarders to Leaving standard. In 1959 a separate high school was opened. Nathalia primary school had 118 pupils and Nathalia secondary college 129 pupils in 2014. In 1961 a Catholic school was opened, extending to secondary education in 1974. The mechanics' institute building, after periods of neglect, was acquired by the Nathalia historical society in 1972. Registered historic buildings in the township comprise the post office (1887) and Butler's Store (1888), one of a row of heritage-listed buildings at 40-54 Elizabeth Street. Nathalia township is situated on a horseshoe bend of Broken Creek from where flooding is held back by a levee bank. Floodwaters were held back in 2012 by a temporary aluminium levee and many residents were evacuated. Behind the levee bank is a large reserve with ovals, showground, tennis courts and a swimming pool. There are three caravan parks, a motel, three hotels and a golf course. The former butter factory is a milk receiving depot for the Murray Goulburn factory in Cobram. The hospital, schools and three churches serve a town of about 1450 people. The railway line from Numurkah closed in 1987. Nathalia shire was amalgamated with Cobram and Numurkah shires and most of Tungamah and Yarrawonga shires to form Moira shire on 18 November 1994. Nathalia shire had an area of 1239 sq km, including Barmah and the Barmah State Forest along the Murray River, Picola and Waaia. In 1994, 739 sq km of the shire was farmed, carrying 17,700 meat cattle, 26,500 dairy cattle and 64,000 sheep and lambs. Wheat and cereals were also grown.